OUKITEL launched the C13 Pro in early March with iPhone XR style. By beautiful dual glass design, latest Android 9.0 Pie OS and cost-effective price, C13 Pro has been favored by many users since announcement. From March 21st to March 27th, OUKITEL is cooperating with Banggood to do flash sale for the C13 Pro. During flash sale, you can get this C13 Pro at just $69.99. The OUKITEL C13 Pro has a 6.18-inch display with a 19: 9 aspect ratio and a notch display on the top front-facing. 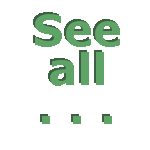 It features dual glass body, showing wonderful visual effect and comfortable hand feel. The rear dual main camera with 8 and 2 megapixel sensors lies on top left and 5 megapixel front camera is located on the notch part of front display. C13 Pro runs on latest Android 9.0 Pie OS, and with new OS optimizing, the 3000mAh battery will last longer than before. C13 Pro also supports both face ID unlock and fingerprint unlock. For hardware, C13 Pro is powered by MediaTek MT6739 quad-core processor. It gets 2GB RAM and 16GB ROM storage and supports 64GB expandable memory. On C13 Pro, you can choose to insert dual NANO SIM or one nano SIM with one TF card. To check more details for this OUKITEL C13 Pro, visit OUKITEL official website. 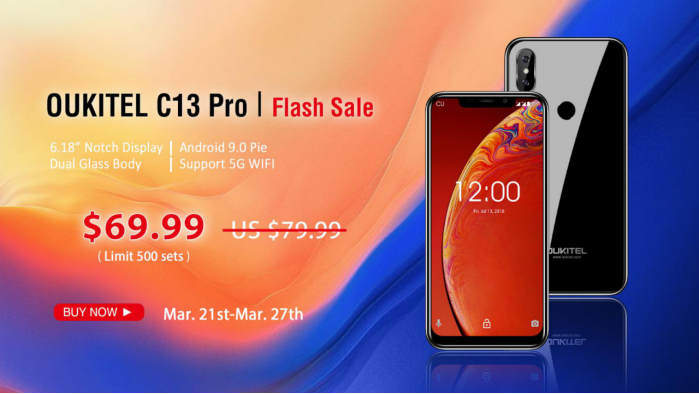 From now until March 27th, the C13 Pro is under big flash sale on Banggood for just $69.99. 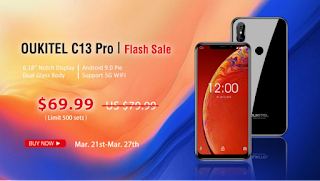 Buy it here: https://www.banggood.com/marketing-March-Ouket-C13-Phone/tid-1944.html?bid=7882&utmid=7480&rmmds=home-top-Banner .